High Ridge Manor, an upscale bed and breakfast in Paso Robles, CA, announced this week new package deals for tourists visiting Central Coast wine country. Proprietors Jim and Cindy Roberts have been catering to the discerning epicurean traveler for over eight years at their three-suite, rustic-elegant wine country B&B in Paso Robles by preparing and serving unique, homemade dishes. The only B&B in the area to be Diamond rated by BedandBreakfast.com’s third-party inspection, their daily dining offerings include a unique take on Eggs Benedict, served with homemade Hollandaise sauce, asparagus and grilled tomatoes, as well as their pecan-encrusted Pain Perdu, a baked French toast dish served with house-prepared, rum-based spiced syrup. But that’s just breakfast. Each afternoon, the Robertsons whip up special hors d’oeuvres like stuffed mushrooms, or their signature, house-cured, savory Bacon Jam (a one-of-a-kind preserve that takes four hours to concoct) served over crostini, paired with a rotating list of local wines. For a complete gourmet getaway, High Ridge Manor now offers several tantalizing wine and dining themed B&B packages that put mere “Room Service” to shame. Ideal for enjoying the warm evenings and epic sunset views from High Ridge Manor, this package includes a full-service, all-you-can-eat winemaker dinner. A guest winemaker treats guests to a private wine tasting paired with tri-tip, spare ribs, corn on the cob (seasonal), potatoes and garlic bread. Package is available for guests booking all three rooms, and must be booked a week in advance. Six-person minimum, 35-person maximum; $50 per person, plus lodging fees. Contact High Ridge Manor for details and exceptions. Package must be booked in advance. $100 per person, plus minimum one-night lodging fee. Contact High Ridge Manor for details and exceptions. Evening Hors D'oeuvres, Friday and Saturday evening at 5:30 p.m.
Package is available for two-night weekend stays for two guests, and must be booked in advance. $975 per couple includes lodging fee. Contact High Ridge Manor for details and exceptions. 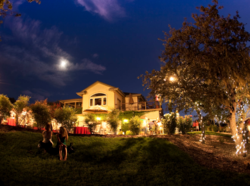 A beautiful, designer B&B in the heart of premier Paso Robles wine country, High Ridge Manor features some of the best views in North San Luis Obispo County and is known for its gourmet breakfasts and afternoon hors d' oeuvres. Guests enjoy 20 acres of lush gardens and sweeping vineyard vistas, in addition to a billiard room and private wine cellar. Each luxury guest suite boasts a whirlpool tub, fireplace, featherbed and private entrance. High Ridge Manor, located on High Ridge Road in Paso Robles, CA, was voted one of the "Top 14 Most Romantic B&B/Inns in the United States” by Traveler's Choice and is the only Paso Robles B&B to be Diamond rated by BedandBreakfast.com. For more information or to book a suite, visit highridgemanor.net, or call (805) 226-2002.